If you need to do government or administration stuff in Berlin, you often need an appointment an the Bürgeramt (citizen center). Unfortunately, early ones are hard to get. Here I’ll show you how you can. To make an appointment, you need to first pick the service that you want to get done, for instance Anmeldung einer Wohnung (registration of a flat, i.e. getting an Anmeldung / Meldeadresse). Then, you can pick a Bürgeramt. To raise you chances for a soon appointment, search for appointments in whole Berlin: click on Termin berlinweit suchen und buchen. Now, you will see a calendar page. They days with free appointment slots are marked as verfügbar (available), full days with ausgebucht (booked out). And you will notice that free appointments are pretty rare. Often, you need to wait 2 months or more. But there’s a trick to increase your chances: Often, appointments get cancelled and get fed back to the database as free slots. The trick is to be the first one to see these free slots reappearing. You can do this manually be reloading the calendar page and checking for a change – or letting a browser plugin to do this. 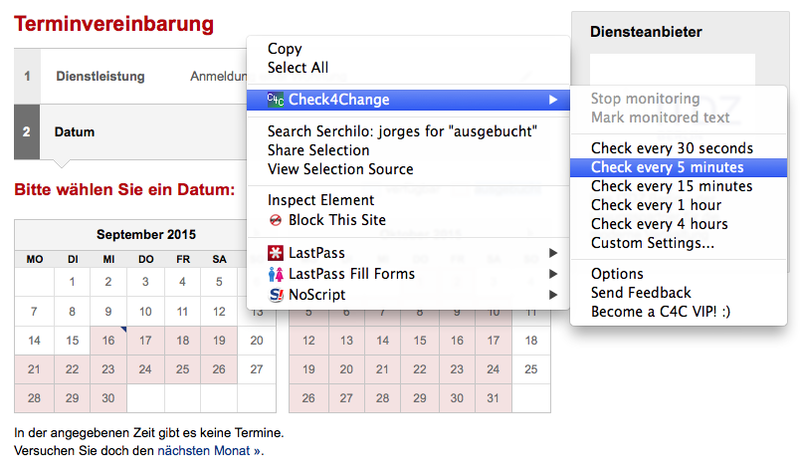 For Firefox, there is Check4Change, for Chrome there is Page Monitor. The plugins will reload the page in your specified interval (for instance every minute – that’s also enough, don’t be evil and overrun their servers). Once there is a change, e.g. a day became available, the plugin will play a sound or notify you in another way (you might want to test the plugin e.g. on a news site to see how a notification looks like). And if this is all too tedious for you, you can also buy an earlier appointment via the service Buergeramt-termine.de.